This week I worked as an Election Judge in Douglas County, Colorado. We are having an “off year” election, with no candidates for national office. 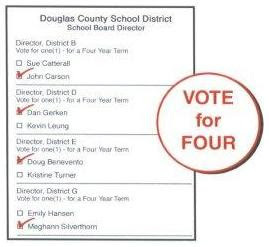 However, we are electing four members to our seven-member school board. The four candidates are recommended by the Douglas County Republican Party, and it appears that the Party is endorsing candidates who are running in a “non-partisan” election. In addition, the Denver Post reports that Colorado Ethics Watch is asking for an investigation by the Office of Special Counsel. The contention is that one of the candidates (Meghann Silverthorn at the bottom of the election form shown above) has violated the Hatch Act because she is employed by the Department of Defense and is running as a candidate for “partisan” political office. Once again, Republicans are causing problems. Here, Republicans make up almost 50% of registered voters. In the City of Kinston, 65% of registered voters are African-American. It is reasonable to assume that most of the voters in Kinston are not Republicans. And so we have Douglas County Republicans under fire for using partisan politics, and Kinston, North Carolina being redressed for NOT using partisan politics. What is the principle being applied in each case? I don’t think it has anything to do with legal issues. In Douglas County, the public school system is the province of the Douglas County Federation of Teachers and Classified Employees. The Douglas County Federation is affiliated with the AFL-CIO, and is bound and determined not to allow voters to create a Republican-dominated school board. In Kinston, Republicans have been kept out of power for years. No local change in voting policy will be allowed to change that dynamic.